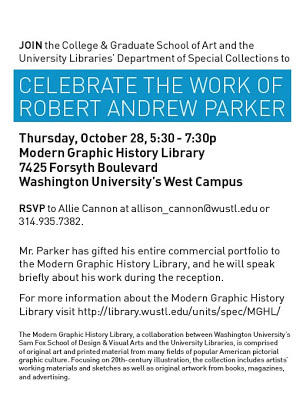 Robert Andrew Parker (not to be confused with another distinguished Parker) will be feted here in St. Louis on Thursday, October 28 at the Modern Graphic History Library at Washington University. Mr. Parker, whose career began in the 1950s, is still at work today. He produced illustrated travelogues for Fortune magazine (reporting on the oil industry, as I recall) early on; played the part of Kirk Douglas's–Vincent Van Gogh's hands and produced the fakes for Lust for Life (1956); generated many illustrated books for children and young people (most notably for me, an edition of Frankenstein); continues to lead a jazz quartet of significant quality; and remains a charming, garrulous, flinty figure. I had the extreme good fortune to meet him and visit his studio in Connecticut when we were in discussions with him about donating his commercial work to the Modern Graphic History Library. Which he did. And for which we are extraordinarily grateful. Thursday's event is a celebration of the completion of the cataloguing of that work at the MGHL, paired with an exhibition. If you're in town and interested in the field of illustration, please come by and join us for an excellent event. RSVP info above.